I’m not exactly sure why that title feels right but it does. I think it’s because today was a satisfying mix of productivity and enjoying relaxing time with my family. The kids and I menu-planned, went grocery shopping and baked muffins and made granola bars. The house still smells faintly of rice and cilantro with a hint of basil and chicken. The kids got baths and were tucked into bed smelling clean and fresh in rooms scented with lavender (we’ll overlook the part where Miles rejoined us to eat a banana after thirty minutes of playing in his bed 😉 ). I honestly love days like this. Simple things. Sweet things. My heart is grateful. I don’t want to be so busy I miss the small moments that add a sense of richness to life. Miles cut his first molar through today, Evie learned what a coconut looks like at the grocery store. I tried a new muffin recipe and Tom was able to go for a long run which he enjoyed. It’s the sacred comforts of familiarity, the reassuring presence of my husband being by my side where he has been through many shared life moments, the gifts my children are, the delight of finished chores. None of those things are particularly noteworthy in and of themselves but together they stilled my heart to worship and humble gratitude for this life I have been given. I don’t always appreciate it all, some days (more honestly, all days in at least some moments) I get lost in the rush of caring for children. Finding missing shoes, answering emails, caring what people think, clicking through tabs, caring too much about other people’s situations, paying bills, washing dishes, folding laundry, planning events, leading discipleship times, contacting people, cleaning the house. I don’t naturally gravitate towards prioritizing stillness but, when I do try to intentionally seek it out I am amazed at the power of solitude and long for more of it. Tonight I stood on the porch in the deepening twilight watching the fireflies dance amidst the pine branches. You can tell it’s getting late in the summer because of the way the air is slightly cool in the evenings. Autumn and Winter are my favorite times of the year and slight hints of them were in the breeze tonight. The way night falls early in late Autumn is like a thick quilt tucking you in, early darkness lends itself to early bedtime and, like the earth has a break from the planting and harvesting so Autumn and Winter give a break to my body. It’s a season that invites time with family and dear friends, evenings inside playing games, firelight, soup and cider, the holidays and reflection on the busier seasons of our year. I’m ready for that and yet, I’m also content here. If there’s one thing this last year has shown us it’s how very much is completely out of our control and what a waste of time it is to try and change that. Grief and loss have been recurring themes throughout the year yet, in close proximity (and likely highlighted due to the stark contrast) has been the theme of gracious comfort. We have come to long for Heaven in a new way this year and it has changed us. I’m grateful. Today was a day of bending, reaching, chopping and stirring and my heart and my faith are better for it. A Place in Progress: Five Decor & Organizing Tips. I’ve held off writing a new blog on décor and organizing for a long time for one key reason: I don’t believe there is ONE correct way to do it! I strongly believe your home should reflect your personal style and what makes your family unique. One excellent example of this is the color white – I strongly dislike white. To me it’s a stark, harsh and boring color. I didn’t wear a white dress on my wedding day (for those curious I went with ivory) don’t like white walls or furniture because to me they’re just jarringly bright and lacking in contrast or depth and you have to walk around on (white) eggshells so you don’t get anything dirty. However, despite my personal dislike of white, some people LOVE it. They wear it, decorate with it, paint with it and it looks great in their homes and in their wardrobe. However, despite the myriad of opinions on this topic, today I decided to write down a few thoughts on organizing and design (which, to me, are very much the same thing. My design style can be summarized by three words: functional, organized and cozy) because I genuinely enjoy it and love hearing people’s thoughts on the same topics. Here are the top five things I consider when decorating my home, after you read it I’d love to hear a few of your tips! Maintaining a clean space is impossible if everything doesn’t have somewhere it belongs. Too many things will automatically equal a cluttered home which makes organization a challenge (to say the least). When we move into a new place (like we just did a few weeks ago) the first thing I do is choose where we will put things. Everything in our house has somewhere it belongs that is not a pile on the floor or on the kitchen counter. Living like this has required us to pare down what we have – I can’t find places in our small apartment for both of my children to have five ride-on toys so they’ll each have one and take turns using them. I would love to have a set of holiday dishes, formal dishes and everyday dishes (what can I say? I love dishes) but I have no room for them so we have one, multi-purpose set of dishes. Ironically, I think I’m as organized as I am because I actually don’t really like spending time each day organizing and cleaning – there are a hundred other things I’d rather spend my time doing so I’ve found ways to allow my daily cleanup process to be faster by organizing ahead of time and fitting our possessions to our space. All of that brings me to my next point. I LOVE BASKETS. I use baskets for everything; blankets, shoes, blocks, laptops, baby dolls, outside toys and books. Baskets allow for quick cleanup and, HUGE BONUS, they’re pretty to look at. Whatever form of storage you use (shelves, canvas bins, baskets) make sure you have it in a strategic place (i.e. near the toys/books you’ll want cleaned up) so you can quickly and easily straighten up (and so little hands can help with it!). While there is nothing wrong with living room furniture you don’t actually have to have a couch set, coffee table and matching end tables. The goal is to create spaces in your home where people feel like they can move without fear of bumping into furniture and can manuever without it seeming like they’re walking through a maze. I chose to have our chest (which stores our board games) and our small cubby also serve as end tables and we did away with a coffee table entirely so we’d have a large, open space for children to play. The ottoman easily moves between seats and also stores behind the recliner if we want the additional space. Our room is to small to comfortably fit two nightstands and a dresser so we chose to have our desk double as our second nightstand and have a cubby organizer be our dresser (can I also just say how easy it is to put clothes away?). There’s no right way to do this the key is just to strike the balance between having furniture and crowding your house with either too much furniture or items that are too large for the space you have. Create spaces that serve multiple purposes – our entryway is also one of Evie’s art areas and this chest not only stores blankets but is where we sit to put our shoes on since it’s positioned right next to the coat closet. Take advantage of the small spaces in your home – empty walls and small corners are gold mines for children’s play areas, storage or to display decorative items! I tend towards using classic color combinations and prints in my decorating style – even in my children’s rooms. It definitely fits my personal taste more to do so but it’s also because children’s interests change so fast that I refuse to spend money on a Frozen themed room that will last a year (though, if Frozen is your style, GO FOR IT! I refuse to make decorating a home the kind of thing where there is a right and wrong answer). I put a lot of thought into my kid’s rooms because I want them to be spaces they can truly enjoy filled with things they love. Evie’s room has her play kitchen, small table & chairs, dolls and stuffed animals, doll stroller, books and dress-up basket. Those are the things she loves to do and I wanted her to have easy access to all of them – the things in her room are all on her level and she can get them herself (and, bonus, clean them up herself!). Miles’ room has his cars, car mat, blocks, and beloved walker and popper toys (also his favorite things). I love warm, bright colors and prints (there are clearly a lot of both in my home) coupled with neutral items (like my couch, blanket on our bed, Miles’ crib, Evie’s toy cubby) to break up the colors so it’s not overwhelming. Figure out what colors, textures, prints and overall style you love and arrange your home around them. Choosing a consistent color palette will make your home feel unified and put together (even if you feel less so ;)) and will help you avoid spending money needlessly because you’ll know if something does or does not belong in your home. Another bonus of choosing a classic look is that you won’t feel pressured to update your home’s look on a frequent basis. A long, long time ago I remember being in a friend’s home shortly after they moved in – as was expected the walls were bare and the furniture was almost the only thing in the rooms. I was there again almost a year later and the house looked almost exactly the same (the main difference was that they had installed a wall-mounted television set). Don’t do that, inhabit the space you live in. Add the touches in your home that reflect who you are and what you love. I love curtains, pillows, lamps, outdoor living spaces, plants, chalkboards, fruit bowls and bright colors. Getting to put those little touches on my home is what personalizes it and makes it feel lived in. Arrange spaces in your home where people can sit and talk. We have chosen not to have a television in our home and one of the most fun things about that to me is that I can arrange all my living room chairs to face each other without worrying about whether or not people can see the television from them. Whether you have a television or not create spaces for conversation in your living areas, create spaces where people can relax, read books, listen to music, build block towers, eat snacks, pray together, dance in circles, look at the stars, apologize, laugh, cry and pray. If you make the space and explain the purpose then nine times out of ten it will be used. I hope this post accomplishes the goal it was intended for: to give ideas. There is not a right way to keep a home and there is no best way to organize or decorate your living space. Enjoy where you live, make it a home and make it yours without a thought that you could be “doing it wrong” (I don’t think anything saps the fun from arranging your space faster than that). Now, off to fold the laundry that has been piling up on my bed since 9 this morning. I cried washing the dinner dishes tonight (which probably got them cleaner then I’m necessarily capable of washing them). Tonight you (proudly) wore your first pair of big-girl underwear to bed and, for some reason it hit my heart in a way that made it feel like you’re leaving for college tomorrow. I don’t even know the days spent with you and your brother can sometimes feel so long in the repetitive tasks they hold and simultaneously so achingly short and utterly incapable of containing all the sweet moments that they do. You guys are two of the ones I’ve waited for every moment of my life I dreamed of having children before I was handed you, the girl who made me a mama two-and-a-half years ago. You two (and the hope for your future siblings) are my heart outside my body, my literal flesh and bone. Your daddy is in class tonight so you asked me to rock you before bed. I snuggled you down with me in the recliner and we whispered about the day for a minute. Usually if I put you to bed we’ll sing, you’ll tell me your favorite part of the day and you’ll (loudly) thank Jesus for something (last night you were thankful for the potty at the park). Tonight since brother was already asleep in my room we settled for quiet, extra-snuggly rocking. Your legs and arms have to fold up to fit in my lap now and your hair is so long it tickles my shoulders when you lay your head on me. My heart aches with love thinking of all the hours I’ve spent rocking you over the last two-and-a-half years. You don’t need it to go to sleep now, it’s just a special time for you and either daddy or I. I want you to know it’s one of my favorite parts of the day. I carried you to bed, kissed you, reminded you to get up and come to the bathroom when you had to go potty, walked out of your room and burst into tears. Remind me never to cross big milestones again without your father present to commiserate with me over how fast you’re growing up (you reminded me of this the other day – I kissed you and told you how happy I was that you are my little girl and you squinted up at me and emphatically said, “no mom, I a big girl”). After I left your room I opened the bathroom door and immediately smiled. The fan had been turned on, the light was off and there, perfectly centered on the small rug was your pink teddy bear. Without having seen you do it I already know you rocked bear to sleep, gave her a kiss and said “wheat dweams, bebe gill” (sweet dreams, baby girl) before carefully laying her on the mat (I also know that if I had dared to walk past the bathroom you would have shot me a reproving look and said, “shh mom, bear nigh-nigh”). Seeing that bear was good for my heart because it reminded me that, though we are inching towards the days of being done with diapers for you, that we are not walking you down the aisle just yet. It’s still passing all too fast though. The days of worrying if you were getting enough milk, wondering when you’d sleep through the night, deciding what your first food should be and watching you experience crawling on grass for the first time all seem so far away. I feel the stage you’re at shifting, you are becoming fully a little girl and not-in-any way still a toddler. Daddy and I have been talking a lot lately about how parenting you looks different now. The things you need have far less to do with a schedule and far more to do with nurturing your character. Believe me when I tell you, little girl, we are on our knees regularly asking God for wisdom to teach you. We are learning together (as we have with so many things with you, our firstborn). I hope that if nothing else we teach you to look towards the future with a joyful spirit and to love other people with a sacrificial heart. I see traces of this in you already. Today your brother fell down trying to pull up on one of your play chairs. He scratched his foot and you were so upset about it. You carried the chair out of your bedroom, down the hallway and into my room so he wouldn’t get hurt on it again and went running back to him saying, “let me see your foot, bubby, I kiss it” (which you did). We badly want to nurture that spirit in you, to show you in Scripture where Jesus loved people that way and to model it for you in our own lives. You’ll need a resilient heart to make it through life with a trusting spirit intact, a heart that knows its identity is found in the Lord because very often people won’t love you back or will forget to appreciate you. That’s ok, you’re still valuable and still enough (more than enough). There have been a lot of things that have happened this year that were completely outside of your parent’s control. Hard things. Sad things. Our goal hasn’t necessarily been to protect you from all of them but to begin, in an age-appropriate way to teach you to handle difficult things and to teach you (as we learn) to love people and receive love from people in the midst of this messy, broken, in-the-process of being redeemed thing that is life. God, grant us grace to do that. I know we’ll have easier stages of parenting you than where you are now and harder ones. It’s good for me to take the time periodically to write it all out like this because it reminds Daddy and I to just enjoy it all as best we can (which for us means enduring the hard moments without spending needless time complaining about them). We love you, Evie Claire and we hope that even at your young age you’re able to feel our joy in the little woman you’re becoming. Sometimes the most profound thoughts are whispered to the surface by the rattle of a drain pipe and the soft glow of streetlights. As raindrops knit heaven to earth God’s invitation to worship draws me outside to the porch, nearer the sky. Maybe profound is to strong a word for these simple thoughts. They’ll likely change no one’s life but mine and, yet, even if they only change mine they still feel significant enough to write down. For me, intentionality leads to better remembrance of Truth. This season of life is a breathless waiting. The gathered breath of preparation before the long exhale of change. Waiting for results, waiting for our precious son to enter the world, waiting for grades, waiting for fruition, waiting for answers. In all the waiting it’s so easy for my eyes to be centered on tomorrow, on then. To overlook the subtler, mundane joys of today. Of right now. 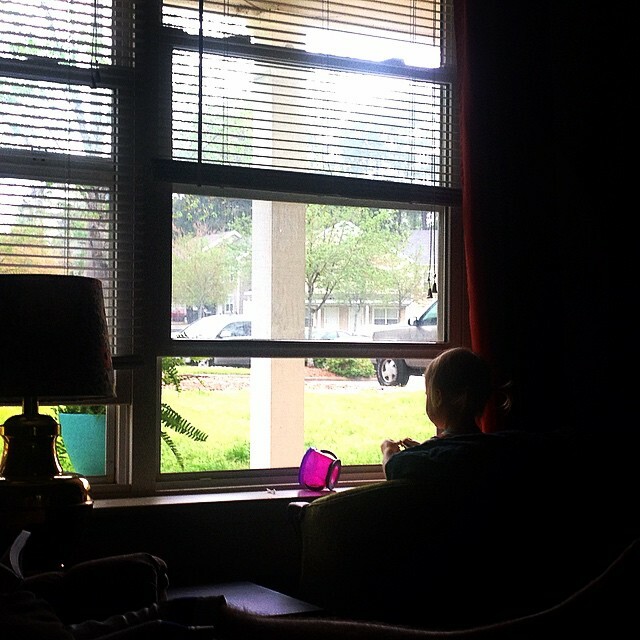 This afternoon I sat and watched Evie watch the rain. She heard the drops start pounding the porch roof and immediately ran to “her” green chair and with a “mama…pease” was situated in it, snack in hand, to watch the puddles forming under the eaves. (if she only knew how much joy her delight in the rain brings her mama). She sat there for a long time. Soaking in the muted beauty of what was without a care towards tomorrow or later. Time passes too quickly to waste a second wishing for the next thing. It wasn’t that long ago that I was cradling her in my arms, a newborn who only knew milk and mama and now she sits, snuggling her baby doll, asking me for cheese and watching the rain. Her brother kicks excitedly around, nestled close to my heart for now, in no time at all I’ll be watching him awaken to the world. Today, with every bit of its hardness, goodness, uncertainty and beauty is a sacred gift, wrapped with a hundred different bows. The satin of Evie’s cheek as she nestles down on my shoulder at bedtime, the delight in Tom’s face when he sees dinner on the table, the quietness of a neighborhood temporarily hushed by the continuous rain, the vibrant red of a cardinal brave enough to visit the bird feeder in the downpour, the quiet sense of accomplishment as Tom finishes a long weekend of class, the joy of hearing familiar voices on the phone and knowing that the Grace that sustains will be new in the morning. We are never truly overwhelmed, never truly defeated because what sustains us, the core of our identity is Eternal and Untouchable. Unhindered by tomorrow and undeterred by yesterday. I can face the future “ever confident” in that reality. I can delight in the unanswered questions of today, not because of my planning or forethought, but because I know Him. I can surrender my husband and children (far easier said than done) because I know that tomorrow is in the best possible hands. I can acknowledge the heartbreak of this world, mourning with those who mourn, because I know it will one day be overcome. Living in today frees my soul to delight. It frees my mind to worship. It frees my voice to praise and my heart to laugh. Lord, grant me the divine grace to remember the truths whispered to my heart on a rainy sabbath when my body trembles in fear. When the unknown is dark. When the path is shrouded. Bind my unwilling feet to rocky paths that I may glean the irreplaceable treasure of You. Freelancing from Home in Forty-Seven Simple Steps. 1) Position toddler on recliner with books, cheerios and milk. 2) Second guess the milk as her new favorite game is “clean up” which involves vigorously shaking her sippy cup upside down. 4) Toddler starts begging for “wawa”. Return cup and vow to watch her extra-carefully with your third set of eyes to prevent needing to scrub milk out of the recliner. 5) Sit down with laptop. 6) Realize laptop is dead and charger is upstairs. 7) Go upstairs for charger while toddler frantically waves bye-bye and dissolves into a flood of tears because, clearly, you are leaving FOREVER. 9) Remember there was a charger downstairs all along. 10) Wait for laptop to come to life. 11) Toddler has read all of her books and is now twisting herself into the curtains. 12) Laptop is finally on. Open article. 13) Client disregarded word limit and article is 800 words above max. 14) Sigh deeply. Editing out 2/3 of their carefully chosen words always takes some thoughtful explaining. 15) Toddler is bored with playing in the curtains and is now determinedly stuffing her baby doll into an almond milk box. 16) Pause in concern that she’ll attempt to put her baby brother in an almond milk box when you’re not looking. Realize you’ll have to cross that bridge when you come to it. 17) Delete three words of article. First line is now edited. 832423641232387473289 more to go. 18) Toddler chooses this moment to remember that “dada” left for work two hours ago and is now yelling “no, bye-bye, NO” out the front windows. 19) While protesting “Dada’s” departure toddler slips on milk which she has poured under the curtains despite your (not so ) best efforts to avoid that exact scenario. At least the recliner is spared. 20) Toddler has bitten tongue. Mother needs to bite tongue. 21) Five lines edited. Word count down to 700 above max. 22) Briefly contemplate who even has time to write 800 words more then are absolutely necessary. 23) Toddler is sweetly hugging her baby . Smile at her and remind yourself to tell husband you want twelve more. 24) One entire page edited. Is this really happening? Miracles are clearly occurring everyday. 25) Toddler has dragged a bench to the window and is now patiently looking for “dada”. Don’t have the heart to tell her she’ll be waiting at least eight hours. 26) It has now been 37 minutes and you’re only 1/3 of the way through. Calculate your hourly rate to ensure this is still worth it. Realize it is…not. Wonder if your contract has a “toddler milk” clause that allows for a pay raise? 27) Hope that your hasty, highly distracted edits aren’t chopping sentences in half. 28) Toddler has spied a robin hopping down the sidewalk. She is beside herself with joy at the “brrrrrddd”. Melt a little bit at her ability to be delighted by the most ordinary things. Ask for grace to do the same. 30) Toddler is now asking to go for a walk. Consider letting her. 31) White maintenance truck pulls into the spot where “dada’s” white work truck is usually parked. Toddler is ecstatic. 33) Toddler realizes maintenance truck is not “dada” and needs a snuggle from mama. She presses a milky kiss to your cheek. Why is there milk everywhere today? No more milk for anyone ever. 34) Try desperately to remember if you called in a maintenance request. Don’t recall anything that is broken (except your ability to edit without interruption – wonder if they have a tool for that?). 35) Realize maintenance man is going to your neighbors. Thank God you can stay in your pajamas and keep “working”. 36) It suddenly starts raining. Toddler is now pointing out the window to show you the “wawa”. 37) Realize it IS a confusing world when she can’t pour her milk on the living room floor but everyone else can pour their water on the sidewalk. 38) ½ page left. The light at the end of the tunnel grows brighter. Hope the light is really the glow of the Keurig’s power button. 39) Toddler is now standing by the front door with the kitchen towel waiting to go outside and clean up the “wawa”. 40) Kiss her a thousand times (despite the milkyness) because her love of cleanliness is your love language. 42) Rapidly draft email explaining to client why their masterpiece was cut by 2/3’s. 43) Try not to take it personally when your toddler points at you and inexplicably shouts “NO”. 44) Send email. Save article. 46) Snuggle toddler on the short walk to the kitchen. Realize how grateful you are. 47) Also realize this is why you aren’t getting much freelancing done lately. Make mental note to determine what else you can cut from the budget to make up the difference. Decide on milk. Definitely milk. These are the Moments that Make up the Days. As unromantic as it may sound that is probably the single, greatest piece of marriage and family advice I’ve read and the one that runs through my head most often in the midst of life’s trials. When Tom & I hurt each other in the same way for the hundredth (thousandth) time. When my daughter pours my water bottle on her pants for the third time in a day. When the laundry, dishes and cleaning all need to be done. Again. When the bills are paid but there’s nothing left for any of the other financial goals we set. When “date night” is, once again, in the living room instead of out anywhere. When pregnancy pains have me up at night before another long day. When the writing deadlines cycle back around. When Tom needs a week of evenings to finish major projects and I am alone. When family is all far away. When Evie is awake at 3:00 a.m. for no apparent reason. When cold & flu season just won’t end. When sunshine and warm weather seem like a thing of fairy tales. When Evie is eating veggie straws off the floor because she dropped her snack cup for the sixth time. When life is mundane, lonely and predictable. When your time with the Lord is punctuated with baby drool and sticky hands wanting to help turn the pages of the “bahble”. In the midst of Valentine’s Day promotions and celebrations it’s easy to forget that love is not proved by roses, jewelry, spa gift cards, dinners out, cards, chocolate, new clothes, vacations, surprises and time away together. Love is not cemented in the moment of breathless yes that follows a proposal. It’s not sealed by the tears that stain hand-written marriage vows or finalized in the intimacy of a long-awaited honeymoon. Those are beautiful beginnings, sacred starts to a life together but they are not the proof of love. Like love’s Author demonstrated, love is cemented by the very moments that you think it should be most absent. Arms spread wide on a wooden cross. In the splitting of yourself to serve another. In the gifting of grace at the cost of your own desires. In the laying down of your very life to make another’s life richer, more whole. More sweet. That’s where love’s true mettle is allowed to shine. To be refined into something stronger than it was before it was broken. That’s where love is proven as the greatest of these. In every one of the moments that won’t make it on a Hallmark card. When you’ve locked the door and your husband picks it, determined to hear the painful words you need to say. When you have been cut open in the most unexpected delivery so your daughter can enter the world and, despite the pain, nausea and blood he whispers that “you’re beautiful”. When you fall asleep in the middle of something important he’s trying to share with you because it’s late and you’re exhausted. When what he needs isn’t a romantic gesture on your part but just the chance to take a nap on the weekend. When love is stopping to fill the empty gas tank despite your own mental and physical tank being on empty. When your sacrifice isn’t noticed or thanked. When your surprise falls flat. When your hard work is taken for granted. Those are the moments that make up the days that make up a life defined by love. A life that will be over all too fast. Love doesn’t take a superhero’s strength. Just a willing heart. It doesn’t require trendy clothes, a model body or a full bank account. Just the commitment to empty yourself and be filled with the passions and goals of the Greatest Lover. When the overwhelming days come; when my heart needs a reality check to be restored to its mission of love, I remember how fleeting the days are. How much I’ve been given in this life and how precious each day I get to hold my loved ones is. I remember how fragile life is, that while we are promised eternity we are not guaranteed tomorrow. I remember how sacred the role of shaping little lives is and how the most significant things you can do in life are rarely ones that are either visible or applauded. When Tom and I hurt each other I have the opportunity to be filled with a demonstrative grace again. To help him move one step closer towards the Lord by receiving grace. When Evie pours water on her pants I can enjoy the sight of her wet little legs running for the kitchen where I already know she’ll desperately grab the dishtowel off the refrigerator and start drying her pants. When the laundry, dishes and cleaning all need to be done I can celebrate the roof over my head, food on my table and clothes on my back. When the bills are paid but there’s nothing left for any of the other financial goals we set I can rejoice that our financial obligations are met. When “date night” is, once again, in the living room instead of out somewhere I can delight in the fact that I have a husband committed to his wife and his family. When pregnancy pains have me up at night before another long day I can pray for the little boy growing in my womb and rejoice in the moments I have left carrying him. When the writing deadlines cycle back around I can be grateful for the small amount of extra income the writing assignments bring us. When Tom needs a week of evenings to finish major projects and I am alone I can spend the time worshiping my Lord and finding new ways to help my family through this season of long days, short nights and limited income. When family is all far away I can be grateful to live in a day when communication, sharing pictures and updating each other on our lives has never been easier. When Evie is awake at 3:00 a.m. for no apparent reason I can delight in the weight of her small, healthy body and rejoice in the feel of her little arms clasped tightly to my neck. In that moment I am embodied love to her, all the security she needs. When cold & flu season just won’t end I can be grateful for the fact that my family has avoided any major illnesses and simply battled a few head colds and an ear infection. When sunshine and warm weather seem like a thing of fairy tales I can rejoice in a world that is soaking in its off-season. The earth is absorbing the rain and gray skies as spring incubates. When Evie is eating veggie straws off the floor because she dropped her snack cup for the sixth time I can accept the sweet innocence that makes her unconcerned about germs. When life is mundane, lonely and predictable I can meditate on three truths: joy is not dependent on exciting circumstances, loneliness is an important part of growth and predictable days are a gift in their own right. When my time with the Lord is punctuated with baby drool and sticky hands wanting to help turn the pages of the “bahble” I can delight in the fact that “Bible” was one of the first twenty words that Evie learned. Life is short, even when the days and moments are long. The gifts are abundant, even when the wrapping is unexpected. The opportunities for joy are frequent, even when all the circumstances aren’t ideal. The choice to accept the gift of today is always ours. Always mine. Is it just me or have the mom wars been especially volatile lately? It’s both heartbreaking and deeply disturbing to me to see the way grown women feel they can address one another, especially behind the veil of social media. Why is it so easy to forget (or to blatantly disregard) the fact that our “opponent” on any given topic is a human being with their own life story, set of convictions and love for their child? Why is it so easy to believe that our personal opinions are the ONLY way for all parents everywhere to raise their children? Why does the list of things you can’t or shouldn’t ask about without fear of offending someone grow ever longer? Why are we so willing to sacrifice someone else’s good name to make ourselves feel better about our personal decisions? The debates over letting your baby cry, cloth diapering, breastfeeding, vaccines, circumcision, co-sleeping, working vs. stay-at-home, formula and about 101 other topics are raging on. The internet is a blessing and a curse in that regard; information and opinions have never been more accessible but, sadly, it has never been easier to find research to be used as ammunition to support any viewpoint. And the enemy on the receiving end of fire? Another mom. I think one of the biggest sources for the mom wars comes when we allow our value as moms to be defined by our mothering decisions. Instead of choosing to breastfeed we allow ourselves to be defined as a “breastfeeding mom”. Instead of choosing to cloth diaper we are a “cloth-diapering mom”. Any decision about vaccinations will be seen as controversial by someone and, whether we vaccinate, delay or forego our choice can become a defining mark of pride. Whatever our decisions we tend to appoint ourselves spokespeople and champion them when asked (and, often, even when not). We forget that choosing differently than someone else doesn’t make us better than anyone else and far to often confidence in our parenting decisions so easily becomes arrogance towards parents who have chosen differently. How much richer would our lives be if we didn’t enter the literally endless debates on all things parenting verbally or mentally? I don’t always say a lot about complicated issues on social media or in conversation but, I sure spend the time mentally debating the pros and cons of other parenting choices. It can feel like an obligation of parenting to read everything, research everything, agonize over everything and consistently revisit every topic to see what you might have missed. It’s endless and exhausting. It IS our job as parents to make informed decisions for the unique set of circumstances surrounding each child we have. The topics mentioned at the beginning of this post are so hotly debated because they do matter (though, some definitely matter more than others) but, so much of the information out there, on every side of any debate, seems to be written or spoken from a place of such fear or arrogance. I don’t want to live the one life I have consumed by it all and I know a lot of other moms who feel the same way. Why is balance so much more difficult to achieve than extremes? Probably because it requires us to make decisions with a calm spirit – not out of fear or pride. For me that is literally impossible to achieve without the continual grace of Christ. Obviously it’s not that Scripture holds a list of vaccination ingredients or schedule for dropping naps – but, when my heart is filled with a peace that passes all understanding is when I am best able to make parenting decisions with Tom for Evie and Miles. In that place of peace is when I’m free from concern about other’s opinions. Free from the need to consult “one more book” and free from the need to justify my decision to everyone I meet. It quells the fear because, really, I think so many of our parenting debates are tied to our desperate attempts to protect and control our children when the simple reality is that, even the decisions we feel most confident in, don’t come with guarantees. Part of parenting is accepting the fact that you CAN’T predict the future, protect your child from every potential accident or ensure the outcome you want for their lives. It’s opening yourself up to a very vulnerable sort of love. Accepting that reality (which is a daily choice and desperately hard at times for me) actually reframes the circumstances surrounding so many parenting decisions for Tom & I. It takes away the fear of “what if” and it allows me the freedom to enjoy what I know to be true today with my daughter instead of spending precious moments consumed with anxiety about what the future holds. And really, isn’t today all we have anyway? Abiding in that place of peace also helps to helps to silence my need to engage in that many mom debates. It’s my job to decide if Evie should have a chickenpox vaccine. Yes. But it’s also my job to model the decision-making process for her as a time of careful research and thoughtful consideration – not a time of panic, heated words towards other moms and medical professionals or catty remarks. It’s my job to decide what kind of diapers we will use. Yes. But it’s also my job to teach my children that there isn’t one right, God-ordained way of diapering your baby and that it’s ok if other moms choose to use cloth, disposables or a combination. It’s my job to demonstrate how to differentiate between major and minor decisions and how to hold convictions with kindness. So many of the topics we agonize over as moms are somewhat to fully resolved by 3-5 years of age. What remains after that is the ongoing job of raising a child into a man or women who has the tools they need spiritually, emotionally, mentally and physically to make it through the rest of their lives. What kind of diapers were used is going to matter very little when she’s fifteen. What will matter is how I spent the 10-12 years diapers were a non-existent issue raising her. What will matter is the conversations we had, the apologies I spoke to her and to her father, the grace shown her when she made a mistake, the tone of our home (God, may be it place of peace and hope. May it be a place defined by honesty and love and forgiveness when that tone is broken). What am I teaching her by how I’m making decisions for her? It’s my job to teach her when her opinion should be shared and when it’s ok to remain silent. It’s my job to teach her how to take fear out of the equation when making a decision. It’s my job to teach her when to ask for help. It’s my job to teach her to be a woman marked by gentleness and respect. Parenting has stretched me to my limit on so many levels. Just when I think I can’t love her more she does something new, something silly or something sweet and my heart expands to a level of affection for her that I didn’t know existed. Just when I think I’ve begun to grasp the level of responsibility Tom & I have undertaken in becoming parents I am faced with a new decision that requires me to be doctor, psychiatrist, nutritionist and sleep consultant all at once. Just when I think I can’t be more tired, well, she chooses that night to fight the comforts of her crib for no clear reason ;). There are a lot of difficult jobs out there but the endless amount of mental responsibility, constant demands for more time and energy and complete inability to change the fact that once you are a parent you are always a parent help me better understand why there are mom wars. Being a parent is hard work. It’s sad though; as parents, especially as moms, we have the capability to be each other’s greatest friends, most beneficial resources and sources of comfort. Can we please start choosing friendship at least as often as combat? To stand next to each other even when we disagree? To sometimes choose silence even when we have an opinion? To create an oasis of peace in a world that’s crazy enough? To choose calm conversation instead of fear-fueled attacks? We have to. For the sake of the children we so dearly love, we have to. Click to follow the blog and receive emailed copies of the posts!